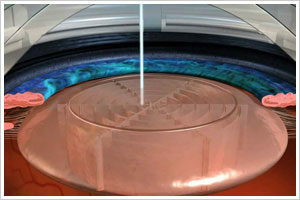 Femtosecond cataract surgery is a recent development in the history of cataract surgery. The femtosecond laser can be used to create cleavage planes via photodisruption in transparent/translucent tissues, focused with the aid of real-time intraoperative imaging . Femtosecond cataract surgery can offer a greater level of precision and repeatability for creation of tissue planes than manual techniques. Femtosecond cataract surgery can predictably manage lower levels of astigmatism for patients electing this correction at the time of cataract surgery, and can improve patient outcomes with presbyopia correcting IOLs. It improves safety and patient outcomes in select medical conditions (Fuchs/dense corneal guttata, subluxed crystaline lens, mature/advanced cataract, etc. ).